The hall lights have been dimmed and the audience waits with bated breath. The conductor takes the stand and the orchestra is ready. But there’s no music. Instead, the room is filled with light nebulae which float rhythmically through space to the tact of the music. Radiant colors stream from the glass instruments on stage, form amorphous structures and hover for fractions of a second above the orchestra before dissolving. Music that you don’t hear but see, a drama of shimmering glass, light and motion. This is just one of Martin de Bie’s future visions. 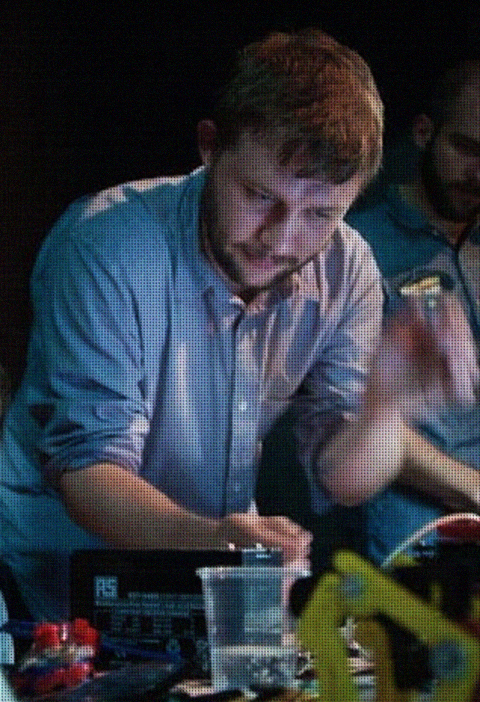 The young Paris-based designer helped found the inter-disciplinary art platform “!RAW collective” and leads student workshops in the creative world of Boisbuchet, is already busy trying to realize his light orchestra. 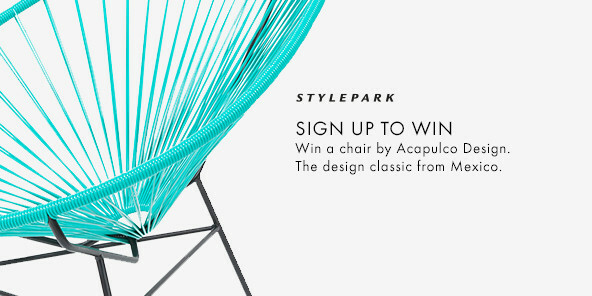 He developed his first instrument, the “Flampoule” together with designer Samuel Aden and presented it at the 2013 Salone del Mobile in Milan. 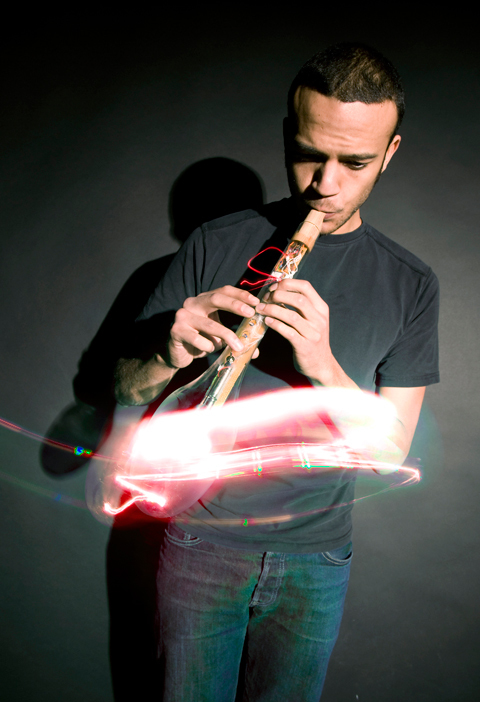 The glass flute caused quite a stir, as the fragile glass body is completely transparent and offers a view of the instrument’s inner workings. 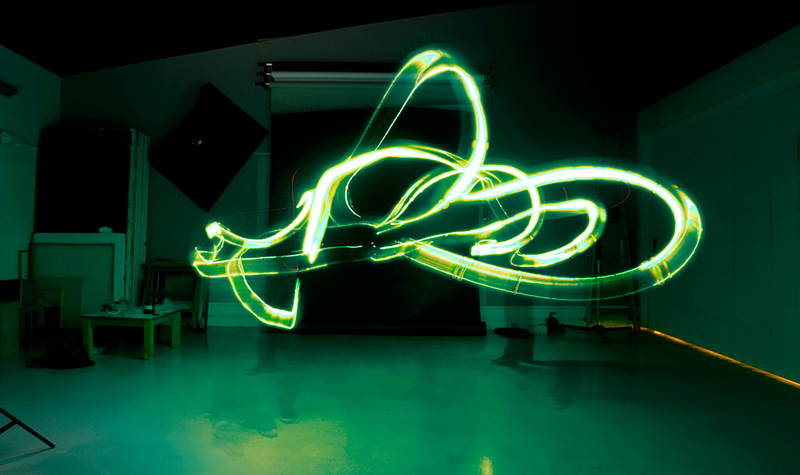 A complex web of wires inside the flute directs dyed ink from a flask down numerous paths; the circulation triggers electric impulses that use LEDs to create light effects. 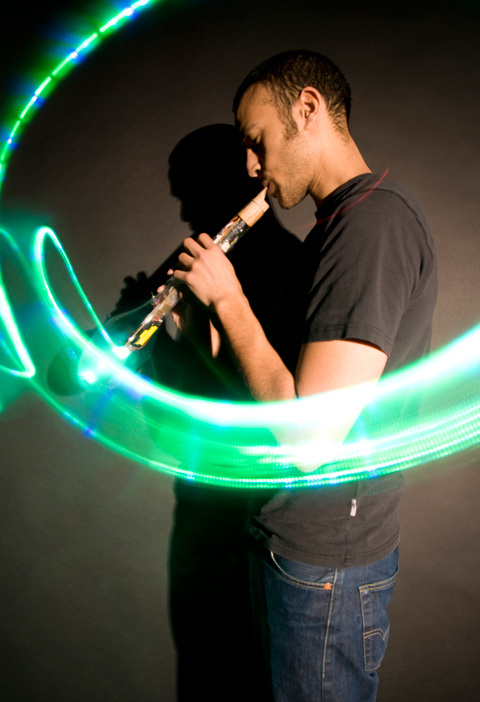 When the flautist plays, this generates and influences the visual effects. Color variations can be engendered by combinations of keys, and the light intensity is controlled by the breath. 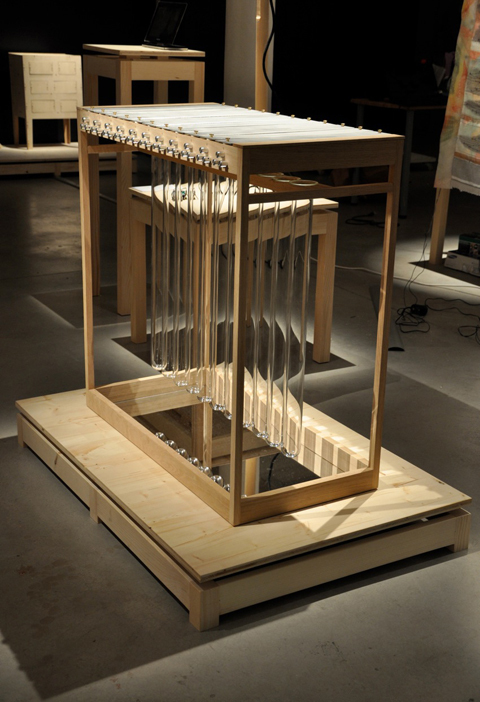 Martin de Bie terms this a hybrid: Something completely new is born by blending two elements, namely the functional principle behind a music instrument and an ingenious technology. The prototype of another hybrid, a xylophone, is already in the making. By means of refined electronic sensors a classical music instrument gains a new use and worlds of sound morph into spheres of light, the language of music transformed into visual effects. So what exactly is the purpose of such instruments? Should designers not approach their work from the point of view of what consumers need and how to combine functionality and aesthetics? Should economic shape and functional handling not form the basis for the design, the graphic user interfaces and the light design, and thus constitute the starting point of all endeavors? Martin de Bie’s whacky ideas and concepts certainly don’t conform to such conventional notions. 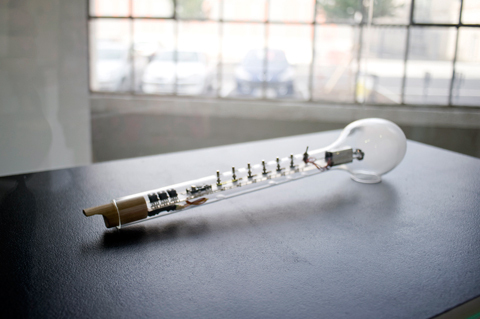 Like his Flampoule, many of his other projects have no real practical application. Instead, they possess a compelling poetic and metaphorical form that is playfully achieved by incorporating experimental technologies. 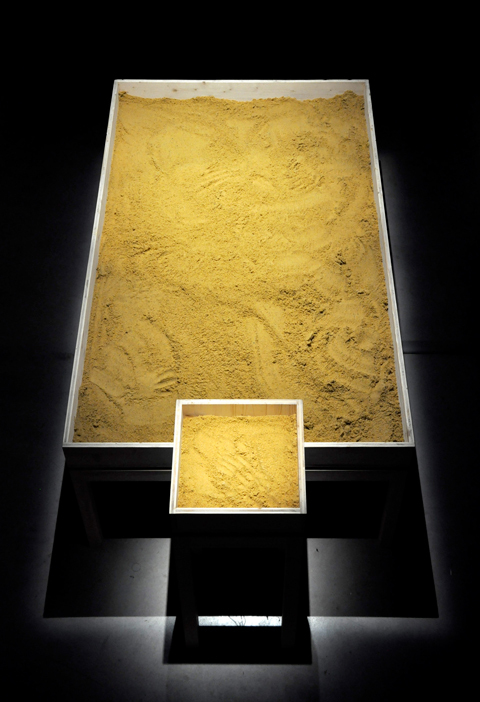 In this vein, Martin de Bie surprised visitors to the “DesignLab” show in Paris, 2011, with a “SandBox of Secrets”, a slightly different and unconventional communication tool. 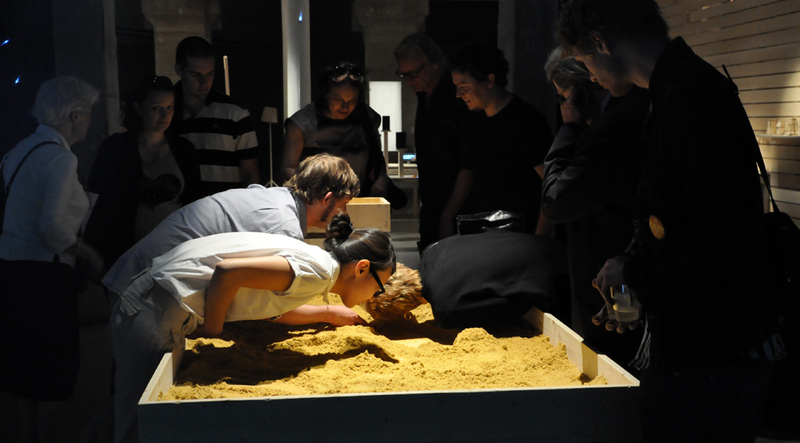 Visitors were able to use their hands to dig out others’ secrets from the wooden sand box and listen to them, or whisper their own messages into the sand. 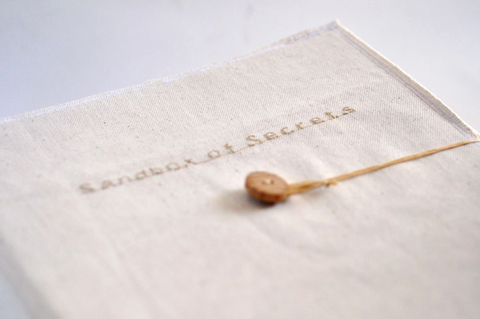 An age when mobile phones are all the rage and new technologies are constantly being born to enable swifter, more efficient and simpler communication, the “SandBox of Secrets” was not a product that met economic or rational demands. Instead it encouraged us to consider people and their ideas in an unusal way by means of gestures and sensory experiences. 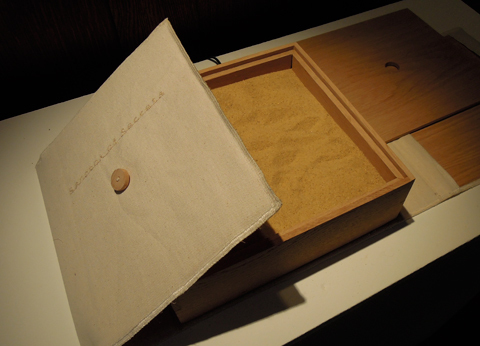 Another of the French designer’s projects uses the same concept. “+GIPS” is an intuitive navigational device shaped like a stone that signals to the user by growing hot or cold in what direction the destination lies. Hoping it helps you find a direct route is pointless. Instead, this deliberately vague means of orientation activates our perceptual faculties and the haptic experience ensures we enjoy exploring the terrain in a more conscious and varied way. Watch, be amazed and feel instead of simply functioning. This is de Bie’s motto and it obeys a general trend emerging in the industry, whereby the focus is no longer on a product’s utility. Like many other young designers Martin de Bie is seen more as a researcher who uses fine sensors as a means to explore new opportunities. The idea is to discover new territory, reflect on conventional design notions and habitual perceptual patterns, and recalibrate the old perceptual filters. The emphasis here is on sensory experiences that are supported by technical functions, which therefore take a backseat. The results are tempting. Because sounding out the potential innate in new technologies without relying on given approaches creates scope for experimental designs that may culminate in new types of products. If from the outset designers only set out to develop a certain product with clearly defined uses, they constrain the range of possibilities and run the risk of simply varying the details of an existing product, whereby its function and purpose remain the same. Sure, a designer who develops something new without worrying about its economic viability may find his “product” being rejected as simply fooling around. But what he gains will be any amount of new experiences and opportunities. Martin de Bie’s designs thus first and foremost whet our basic human thirst, our deep-seated yearning for sensory experiences in a world that is becoming ever more techy and abstract. The gates to sensory perception are wide open when using and viewing his products. Beyond all utility, they provide amazement as well as haptic and aural delights. It may seem paradoxical that a highly developed and complicated technology underlies the experience. De Bie’s “Flampoule” impressively embodies this intractable opposition: The technology blends with a truly poetic creation of light, transposing the viewer into an artificially created world full of sensory stimuli. Who know, perhaps the hybrid orchestra he is planning will afford more than sensory experience and be quite practical. After all, visualizing music using a sequence of sounds that generate sensory perception at a different level may be ideal for deaf people. Martin de Bie certainly seems to be bubbling over with curiosity and ideas. He’s forever busy building things, soldering bits together, chiseling away at new projects and will no doubt come up with some magical light beacon before long.